There’s plenty to see on the reefs during the low tide. It surprises some Americans when they find that there are quite few Okinawan families who are keen to get to know military families. Unfortunately, the reality is that there are many language and cultural barriers, and very seldom opportunities. Now a dive shop in Yomitan, “Natural Blue,” and a local English School, “Eikaiwa NaNa,” have partnered up to make this happen. They have taken this situation into consideration, and after a thorough research, they have decided to organize a one-day outdoor workshop to provide an opportunity for local and foreign families to get together, have fun and get to know each other. Children compare their findings after the reef experience. 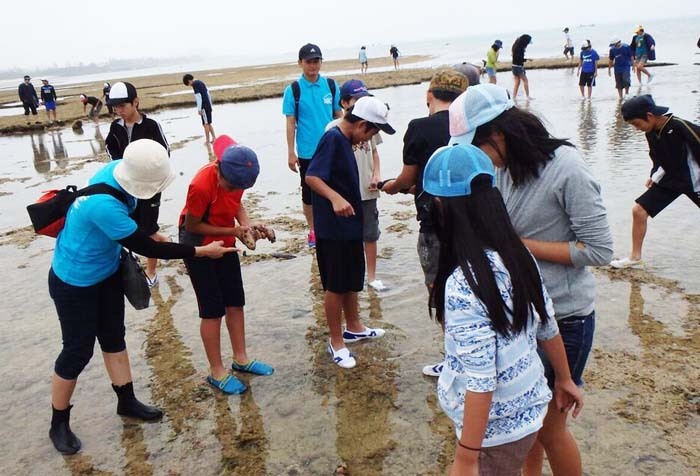 Taking advantage of the unique marine life and the beautiful Okinawan weather and the beach, they have organized a little adventure along the seashore if Zampa. During the low tide, marine life gets trapped in puddles, and they become visible even the water is ankle-deep. Thus, “Seashore Adventures”, will take place during the low tide. It’s safe for the children, and they won’t get wet, as they don’t have to wade in the water. Organizers have also prepared games, such as treasure hunt and bingo, and photo frame workshops for both the children and the adults to enjoy. 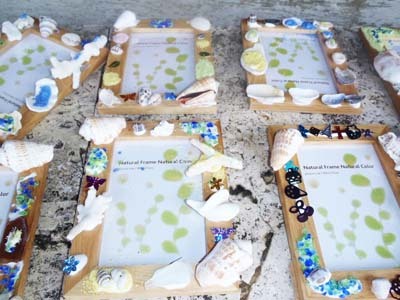 Making photo frames of shells is included in the workshop. Natural Blue dive shop is actively engaged in environmental education, emphasizing on marine related subjects. 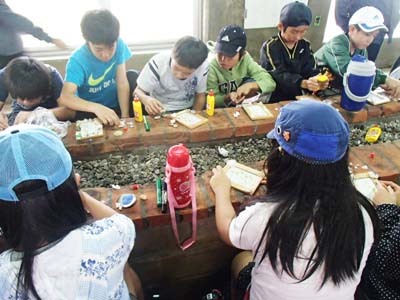 They have experience in organizing outdoor marine activities for elementary school field trips and school trips, and also conduct indoor classes in local elementary schools. The event takes place on Sunday, Apr. 10th from 13:00 to 16:00 at Cape Zampa. The cost is $5.00 per person and children under four years of age are free. Participation is by reservation only, no walk-ins. To join, email Lina Nakama at abcstar038@gmail.com. Participants are asked to bring towels and a change of clothes, and let organizers know if water shoes for walking on the reef are needed. AMICUS, school in distress – Is Obunsha friend or foe?